Everybody likes to get a second lease on life, no matter who you are or what your professional occupation is, but, sadly, few of us rarely get that chance. Isn’t it nice to relive things again? Swedish band Sorcerer must’ve kept their dream alive for more than 20 years. A couple of demos issued way back in 1989 and 1992, the band never got truly materialized as main players Johnny Hagel (bass) and Anders Engberg (vocals) went on to join other bands, Tiamat and Lion’s Share, respectively. 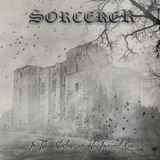 Only true epic doom genre insiders probably heard of Sorcerer, like John Perez of Solitude Aeternus, who reissued those two demos on his own label. Having not experienced those demos, In the Shadow of the Inverted Cross is essentially a debut album of Sorcerer for me, as I am sure it will be for many others. It presents then an interesting paradigm, of being something rather old school epic doom metal, conceived and executed in the realities of today. Sorcerer probably would be the first to admit that they are not reinventing the wheel with In the Shadow of the Inverted Cross, and Candlemass, Count Raven, as well as Solitude Aeternus, have created in the similar realm before. At the same time In the Shadow of the Inverted Cross stands strong, whether you examine it one song at a time or play from start to finish non-stop. Pleasant feeling of comforting familiarity, coupled with strong melodies and warm organic sound, is the ticket to success Sorcerer rides mercilessly on In the Shadow of the Inverted Cross. Engberg’s clean powerful voice floats atop pounding riffs, with each song having a distinct vocal hook of its own. Speaking of the vocals, Anders’ power metal background is an interesting wrinkle in the Sorcerer approach to epic doom, but I can’t imagine they don’t hear similarity to Europe’s The Final Countdown in the opening line of The Dark Tower of the Sorcerer. Slowest and heaviest Lake of the Lost Souls, probably my favorite track on the album, reflects Anders’ powerful pipes the best and probably comes up with the best hook on In the Shadow of the Inverted Cross as well. With moves worthy of seasoned veterans, Sorcerer have a knack of creating thematic songs which actually reflect their titles. Sumerian Script is completely mid-Eastern sounding, and multiple voices hysteria of Exorcise the Demon do hint exorcism. Acoustic balladic sections of Prayers for a King and Pagans Dance do not appear cheesy and after heavy melodic harmonizing proceeds in parallel, there are actually reasons to believe in the lyrics of Prayers for a King, as well as imagine some contemplative, rather than wild, pagans on Pagans Dance. At the same time, not to drag the whole album in steady mid-tempo gait, Sorcerer throw faster curveballs in the form of Exorcise the Demon and The Gates of Hell. Exorcise the Demon is a body-slamming jolt after the dreaminess of Lake of the Lost Souls, and The Gates of Hell is one cool catchy gallop. The final noteworthy element is Kristian Niemann’s (Therion, Demonoid) leads. Bubbling through before unleashing fully on mainstage (The Dark Tower of the Sorcerer), providing a fantastic expansive plateau after Celtic acoustics and drumming in Lake of the Lost Souls, or going especially crazy after the bearish posture on the title track, Kristian’s leads are not only skilled and thoughtful. They are inseparable and integral parts of the In the Shadow of the Inverted Cross compositions. I do not care if people will find this album dated, something done before many times over. Sure, all band references listed above are entirely valid, but that does not detract one ounce from how much I enjoyed In the Shadow of the Inverted Cross rocking along to every note.